The shift from summer to autumn is palpable in the way people carry themselves in the days leading up to the Fall Equinox; some glide gracefully on a perfumed cloud of Pumpkin Spice, happily donning cardigans and cozy new boots. Others seem tense, with subtle changes such as a jaw a little more clenched than normal or shoulders a little higher than they should be. It makes sense that we’re all experiencing a shift; the dualities of this time of year are intense and intricate. We’re surrounded by a bounty of fall vegetables and fruits, but the increasing busy-ness of the squirrels gathering the first fallen acorns reminds us that the season of scarcity is just around the corner and it’s time to start preparing ourselves for it, in ways beyond the purely physical. At this time of year I often feel a bit like a squirrel myself - I’m busy freezing elderberries and gathering nuts and drying the last summer’s fruits to use in rich fruit cakes and breads in mid-winter. Even on days when I am mentally calm, my body calls my attention home with physical symptoms of anxiety that remind me just how important balance is in moving through this season. I sit in a sun-drenched window seat feeling fidgety and restless, wondering why I am having such trouble focusing or sitting still, why my attention seems to be pulled in a million directions at once and my heart is beating just a bit faster than it should be. Perhaps the first yellow leaves falling outside my window are a subconscious reminder that now is a time to be busy, busy, busy or else winter’s hardships will hit me hard. But, unlike my ancestors who relied solely on their crops or forages to make it through the cold season, I have the conveniences of modern living. My survival does not depend on my frantic energy during the end of harvest season. And yet, it still comes calling with a reminder to tune in. So I pause. When I feel like life is moving a little too fast, I go slow. I sink into the silky softness of a hot bath or a long wander. I let myself pause at those golden moments of life of early morning’s sunlight or evening’s lengthening rays. I remind myself that these days are a beautiful balance of light and dark, of action and dreaming. I find ways to get closer to the land. I hunt for balance in the same way that I hunt for physical sustenance. Here in Idaho, fall marks the beginning of hunting season. People don camo and head out into the woods to become closer to nature, but also to fill their freezers with food for the winter ahead. For many hunters I know, this process is an important and beautiful seasonal practice as well as an affordable source of proteins to share with their family. I certainly view myself more as a gatherer; I prefer the meditative feeling of digging through earth to pull up roots or pushing aside duff to reveal mushrooms. But both practices feel ancient and special, and can certainly co-exist on the plate in a way that feels in-tune with the natural world. Both hunting and gathering give one a reverence for landscape in a way that wandering through it alone does not; both digging roots and hunting deer is the ending of a life in cycle that we’ve been a part of forever. So, this fall, sink into balance. Fill your bellies with the foods from your landscape, whether that is venison or roots or both. Get outside and indulge your instinct to stock up for winter, then return home to a cozy kitchen and work slowly and purposefully to create a meal for slowness. Settle in to a calm fall evening. Let your body get a little more rest than you needed in summer. And, as always, remember that you are part of a larger cycle and be careful to only take your share of wild ingredients. Have compassion for the animals that depend on the plants you harvest or the populations that need balance, just like you. This hearty dish a glamorous re-make of the classic comfort food shepherd’s pie. Though shepherd’s pie is traditionally made with lamb or beef, it’s just as delicious when made with leaner wild games like venison or buffalo. 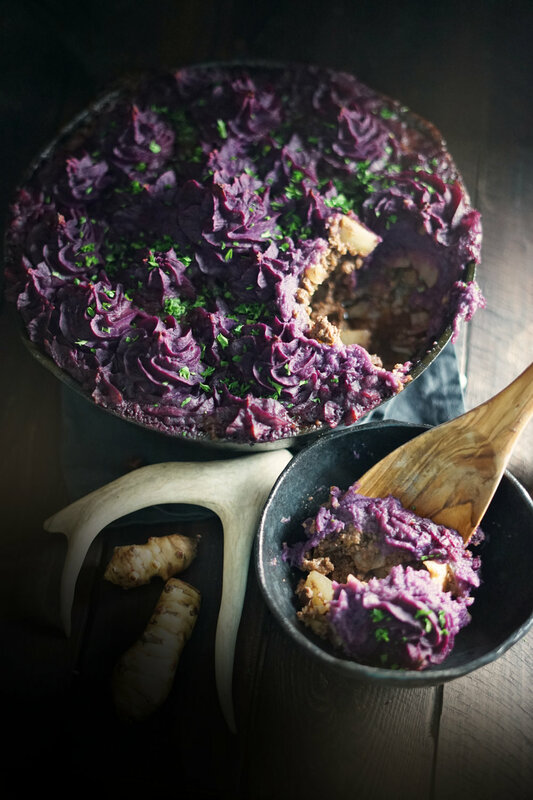 Purple sweet potatoes add a festive color and lots of healthy anthocyanins, and root vegetables such as turnips and sun chokes add a pleasant texture. Dried mushrooms give this hearty dish a little extra depth. 1. Bring a medium pot of water to boil and peel the purple sweet potatoes. Cut them into 1” cubes and place in the water. Boil until they are very soft. Drain, reserving the liquid. 2. Mash the sweet potatoes with the butter, salt, and vinegar. Add some of the reserved purple liquid as needed to make a smooth consistency. (Alternatively, you could add milk.) Beat with a hand mixer until fluffy and smooth, then spoon into a pastry bag with a large star tip. 3. Heat the oil in a large cast iron skillet and add the onion pieces. Cook, stirring occasionally, until the onions are transluscent. Add the garlic and cook until fragrant. Add the turnip and sliced sunchokes and cook a few minutes longer. 4. Add the ground meat and cook until no pink shows and the meat is thoroughly browned. Add the grated zucchini, Worcestershire sauce, soy sauce, mushroom powder, and catsup, plus salt and pepper to taste. Cook until the vegetables are tender and the liquid has reduced. 7. Remove from oven and garnish with the chopped parsley. Serve immediately. With each bite, savor the wildness that nourishes you and the beautiful transition to fall. And, as always, this post is available to you thanks to the contributions of my generous patrons. For anywhere from $1 to $100 a month, you can support my goal of sharing wonder with others while benefitting from special perks like secret recipes and gorgeous downloads! Learn more about this program on my patreon page.